Scroll over the numbers on the right to learn more about the ION Water Cooler. The ION outperforms every other water cooler on the market! Every glass is freshly filtered and instantly chilled in a Sealed Water Pathway, where air never contacts the water supply. Unlike other coolers, ION's proprietary design has no reservoir to clean or sanitize. Enjoy an unlimited supply of freshly filtered water that is 42°F or colder. No other cooler even comes close! Tea, cocoa, and even instant soups are delicious with piping hot, freshly filtered water. 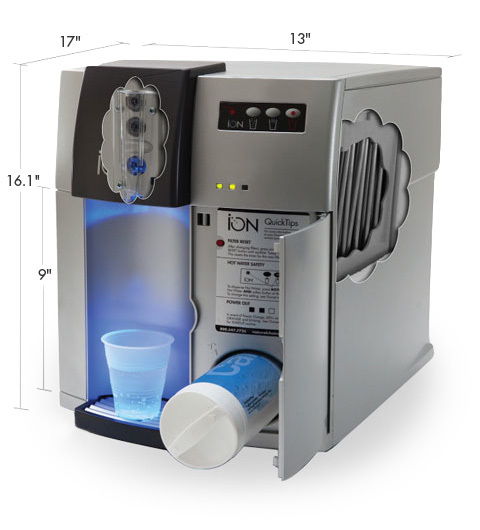 The Sparkling Water in our 904 Model ION replaces soft drinks and bottled sparkling water! Perfect with juice, a twist of lime, lemon or orange, or any flavored water enhancer. It’s delicious! The Pure Alert Filter Monitor indicator lights switch from solid green to solid red when a filter change is required. Our NSF 42&53 certified filters are replaced every 1500 gallons of use or 1 year – whichever comes first and is included in your service with ClearView Water. Why run an appliance when the building is empty? ION's SleepMode™ reduces energy consumption on evenings and weekends. The ION exceeds all Energy Star ratings! Our compact cooler fits anywhere – from your break room to Customer waiting areas. Available in both countertop and stand options. Easily fill cups, carafes, coffee pitchers, and water bottles. Unlike traditional coolers with a water storage tank, the ION’s Sealed Water Pathway ensures bacteria, algae and other airborne contaminants don’t settle into your water supply. In this proprietary and closed system, water does not see the light of day until it is dispensed from the BPA-free recessed faucet. Requires a second hidden button to be pressed to dispense hot water. The removable Drip Tray is easy to clean and is dishwasher safe. Your CarbonPlus, CarbonPhosphate, CarbonSilv or NanoTek Filter.